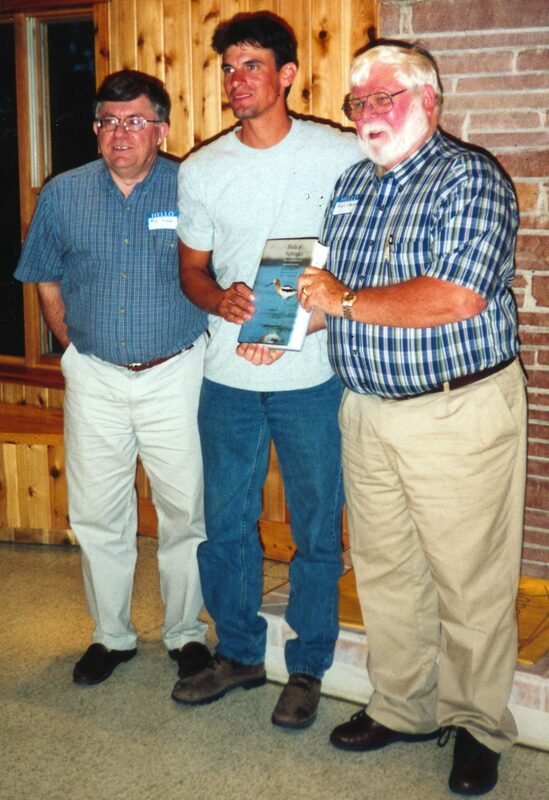 Silcock (left), Jorgensen and Sharpe at the Nebraska Ornithologists’ Union Meeting at Halsey, 29 Sep 2001, shortly after the original Birds of Nebraska: Their Distribution and Temporal Occurrence was published by the University of Nebraska Press. This project would not have been possible without the contribution of a number of individuals. Mary Bomberger Brown, Andrew Caven, Stephen J. Dinsmore, Lauren R. Dinan, Angela Dwyer, Jeffrey J. Lusk, John P. McCarty, Matt Rabbe, Wayne Mollhoff and Mark P. Vrtiska all reviewed and provided helpful comments for individual species accounts. Wayne Mollhoff provided helpful information from his many years of important work on Nebraska’s breeding birds. Mark A. Brogie shared his expertise about a number of rare bird occurrences. Mary Bomberger Brown and Ted LaGrange reviewed and provided helpful comments that improved the Introduction. Rachel Simpson reviewed maps and provided comments that improved their presentation. Thomas Labedz facilitated access to and provided insights about specimens at the University of Nebraska State Museum. Dan Catlin, Kelsi Hunt, Jerry Toll and Mark Vrtiska graciously provided access to unpublished data. We thank the Nebraska Game and Parks Commission for hosting this website and especially value the contributions of Troy Kroeger and Cara Pesek, as both were critical in creating this online platform. Lauren R. Dinan and Melissa Panella assisted with website development. Phil Swanson, Boni Edwards, Michael Willison, John Carlini, Mark A. Brogie, Kathy DeLara, Marie Smith, Cory Gregory, William Flack, Charlotte Croshaw, Ben Ream, Paul Dunbar, Steve Kruse, John Sullivan, Caleb Strand, Marshall Iliff, Tracy Utter, Amanda Georgian, Paul Roisen, Wayne Mollhoff, Sam Manning, Bob Gerten, Aaron Brees, Mark Hammer, T.J. Walker, Susan Wistine, University of Iowa Museum of Natural History and NEBRASKAland/Nebraska Game and Parks Commission generously provided photographs used in individual species accounts. Jaclyn Cruikshank Vogt assisted with acquisition of photographs from the NEBRASKAland library. Joel Jorgensen would also like to thank the support he received from the Nebraska Game and Parks Commission to work on this project over the last few years. We wish to acknowledge the contribution of our late co-author on the original Birds of Nebraska: Their Distribution and Temporal Occurrence, Dr. Roger S. Sharpe. Many of Roger’s contributions on the original edition remain important in this revised version. Finally, we wish to thank all the like-minded individuals that share a common interest in Nebraska’s birds and who have reported observations and shared their insights, either formally through written discourse or informally in casual conversation. Collectively, these individual observations and perspectives have contributed to this project and are important in summarizing the status and distribution of Nebraska’s birds.